Practical and attractive wall mounted matchboxes. The match box holder looks a lot better then having the box of matches just sitting on the mantle. Its made of thin sheet metal for this day and age its good quality if it was heaver metal I would have given it 5star. The only other issues I have with the one I got is that it looks like it was dragged across something taking the paint off the bottom of it if you where to have it sit on a shelf you will never see it, To much of a hassle to send it back to replace. I will probably just touch up the spots with a sharpie. 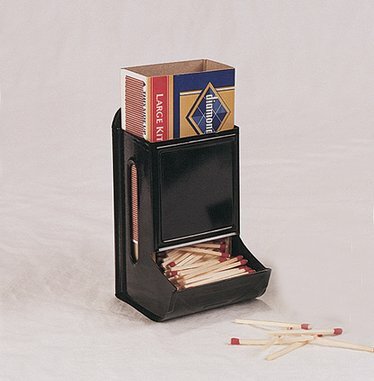 I have a pellet stove.I was tired of wondering if the BBQ type lighter would work when I needed it.Or trying to find it if misplaced by others previously usuing it.So when I saw this U.S. Made match box holder I bought it and it now hangs near the pellet stove.Ready to go when needed! A very handy item,not found in stores around here.Thanks for having such a practical item! Charles Smith,Conn.